1978 S-K Tools Ad w/ A.J. Foyt Jr. & A.J. Foyt Sr.!! Vintage Paper Ads > Construction - Industrial > Tools - Machinery > S-K > 1978 S-K Tools Ad w/ A.J. Foyt Jr. & A.J. Foyt Sr.!! 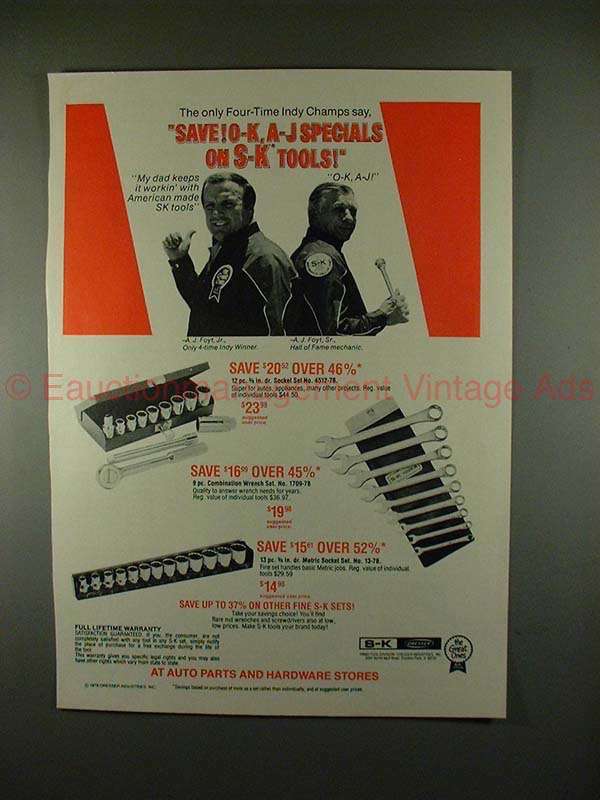 This is a 1978 ad for S-K tools, featuring A.J. Foyt Jr. and A.J. Foyt Sr.! The size of the ad is approximately 8.5x11 inches. The caption for this ad is "Save! O-K A-J specials on S-K Tools!" The ad is in great condition! This vintage ad would look great framed and displayed! Add it to your collection today!